Well, I have not gotten much more sewing done in the last week since I wrote that last post, but as I sit at work in the nearly 90°F afternoon and just flipped on the A/C window unit I keep ogling the fabric shelves. I've been really good about not buying fabric lately, primarily because I haven't been doing ANY sewing, so it's hard to justify that I'll actually use any of it. But a girl can dream, right?? So I've put together a few combinations of fabrics both new and not-so-new that have been tempting and teasing me for anywhere from a week to 6 months or more. And I may have inadvertently found a combination of 3 that go together SO WELL I just have to get them! Welcome to the tip of the iceberg. L-R: "Down Under" by Mint Blossom for Northcott; "Tree Rings" by Martha Nagley for Rowan (and let me just say I fall in love with every color way of this print I see! 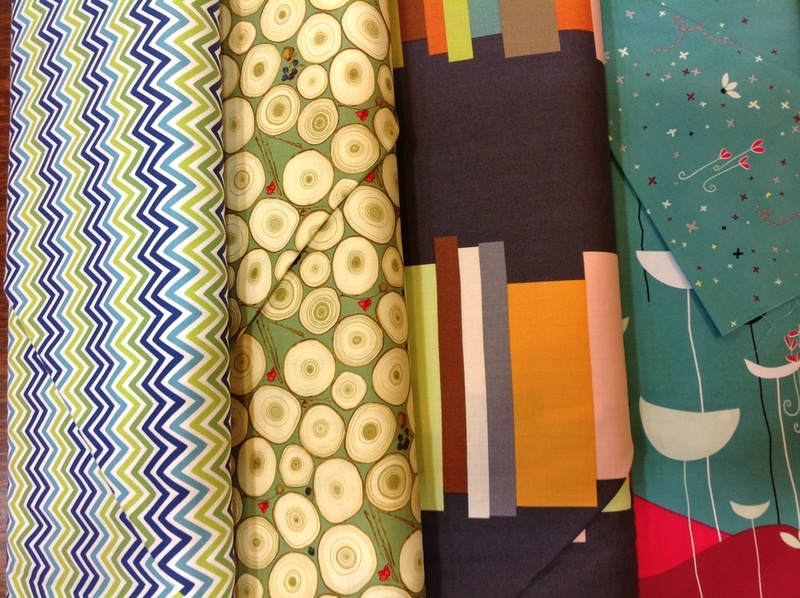 ); "Volumes - Hand Drawn Garden" by Anna Maria Horner for Free Spirit; "Nordika" by Jeni Baker for Art Gallery Fabrics. This grouping maybe not so well coordinated, but I love them all for different reasons. And I have NO idea what I would use any of them for! L-R / top to bottom: "Briar Rose" by Heather Ross for Windham; "E-I-E-I-O" by Jack and Lulu for Dear Stella; "Winter's Lane" by Kate & Birdie Paper Co for Moda; "Belle - Coriander" by Amy Butler for Rowan; "Uno" by Stof; "Go Fish" by Hoodie's for Timeless Treasures. After spending the last 2 days working on this, I don't think this post was ever meant to make it to publication. I learned that though it is possible to write a new post from my iPad, it is not easy to do. This is what I get for letting the blogging skills wane for so long! L-R / top to bottom: "Jungle Jive" by Maria Kalinowski for Kanvas; "A Ghastlie Web" from Alexander Henry Fabrics; "Broome St. Floral" from Alexander Henry Fabrics; "Cosmos" by Laura Gunn for Michael Miller; "Lush Uptown" reprint by Erin Michael for Moda; "Modern Meadow Herringbone" by Joel Dewberry for Free Spirit; "Poppy Modern" by Jane Dixon for Andover.